We wanted to give Zita a surprise, we’ve planned this baby shower – veg party for weeks. Oh, she will love it! Oh, she will be so surprised! Oh, she will have all the time to read all our posts bursting with love just before delivering the little bundle of joy. And yes, she made us the sweetest surprise. Tonight she sent us a text. Adam was born at 6.53pm today. He’s beautiful. Can you see my happy goosebumps from there? Yes, I bet you can! So, Zizi, we beg you pardon if we are a bit late, but today, in this beautiful May Day with blossoms in the trees, warm sunshine and birds chirping, there’s yet another reason to celebrate, your sweet brand new Adam, the newly born nephew of this huge crazy family of blogging friends and aunts! Zizi is a vegetarian blogger, or better, for me she is THE vegetarian blogger. She is a true inspiration when it comes to create appetizing dishes with vegetables and other things that were almost unknown to me before meeting her. Just to name one: tofu. In my Tuscan oriented mind tofu was just a white and pale slice of something absolutely tasteless before she visited last year and took possession of my stove for one evening. Add a bit of soy sauce, roast here, sauté there, cube the tofu, add a bunch of healthy broccoli and do not forget to generously add the minced garlic into the pan. In a few minutes she made such a delicious vegetarian dish with tofu and broccoli, and from that moment on, when I feel like having tofu – yes, she made this happen to me! – I just follow the same recipe and add whatever vegetable is in season. 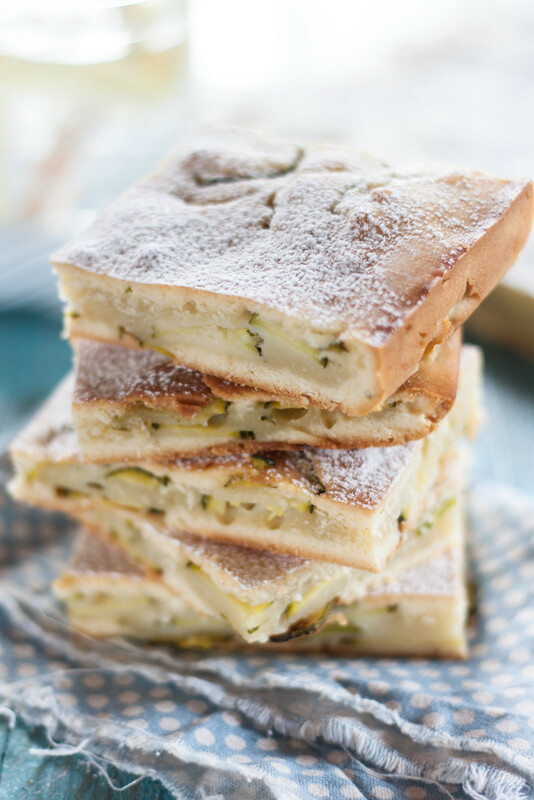 That’s the reason we’re throwing a vegetarian baby shower for her, and that’s the reason I ventured for the first time to try this traditional Tuscan recipe I bookmarked months ago, a sweet zucchini cake known as scarpaccia. Scarpaccia means literally old shoe and if you look at the pictures you can guess why they decided to give to this cake such an unappealing name: it has the same thickness of an old shoe sole! 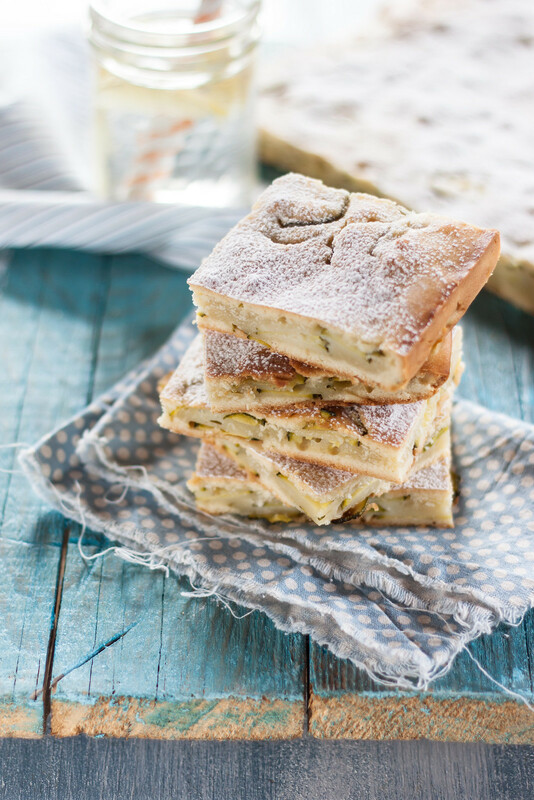 It is a traditional cake from the coastal town of Viareggio, located in the North Tuscany in Versilia, and it was traditionally baked during the zucchini season by old sailors with the vegetables of their garden. 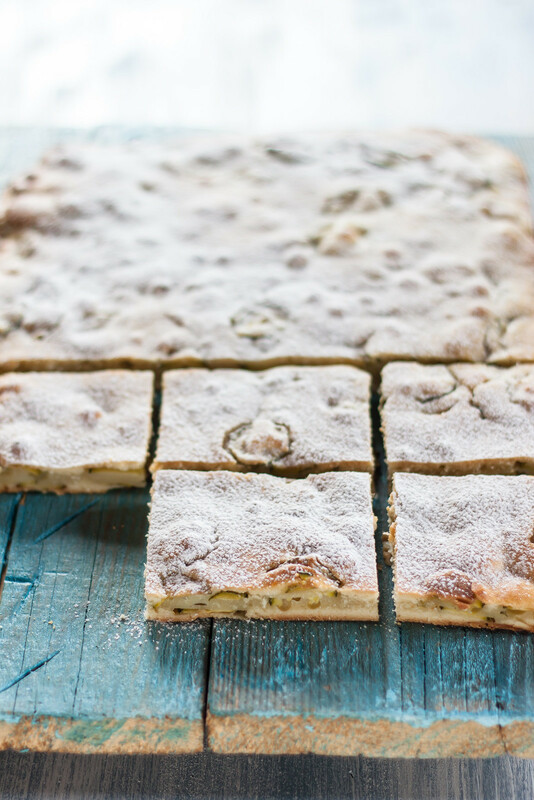 This zucchini cake is not too sweet, has an unusual green taste for a cake and keeps its moisture thanks to the thinly sliced zucchini that enrich a simple batter made of flour, milk, egg, sugar and olive oil. Do not forget a few leaves of fresh basil to make this cake even more aromatic. 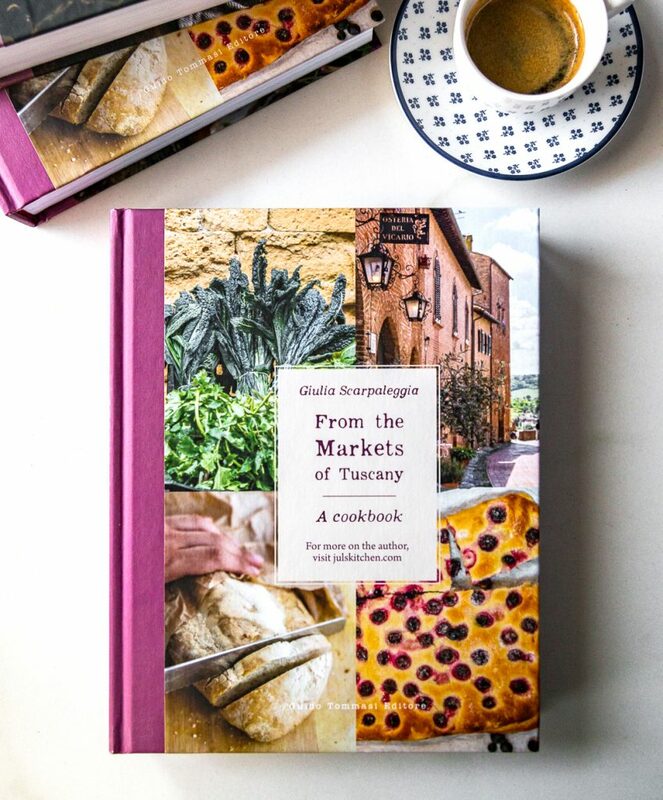 The recipe comes from one of my favourite books of Tuscan cooking, Giovanni Righi Parenti’s book La cucina toscana. Arrange the thinly sliced zucchini on a kitchen towel and season with a pinch of salt. Leave them aside for about one hour, so thy will lose a bit of liquid that could make the cake too wet. Whisk the eggs with the sugar, milk, olive oil, flour and vanilla seeds, then add gently the zucchini and the trimmed basil leaves. Grease a 25 x 40 cm baking tin with olive oil and scoop the batter inside. Bake for about 45- 50 minutes until golden. Let it cool down and serve dusted with icing sugar. Here’s our veg party for Zita, Ivan and their little newly born Adam. 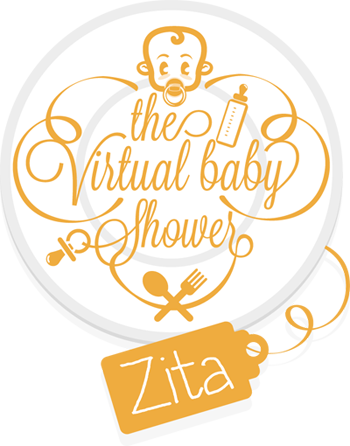 Join us to celebrate Zita’s new baby in this beautiful spring day! So exciting this was, I had such a feeling she would give birth sooner and that it would be too late! I hope she will get a minute to sit and enjoy 🙂 Your cake looks wonderful and just perfect for Zita. If only we could go and visit her in hospital with all this food! A beautiful cake! Really original. It’s texture is really interesting. a sweet zucchini cake – yes perfect for the occasion! 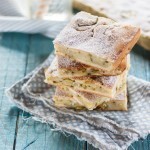 Note to self: get zucchini at the market and make Giulia’s cake this weekend! have a happy May day all! There’s no better cause for celebration than the birth of a gorgeous baby! What a lovely and unusual cake to celebrate. What a lovely idea Juls!! And your choice for celebration is perfect knowing Zita! Perfect balance of healthy and happy!!! I am going to try this soon.. After a few more recipes from your book! Damn that looks delicious!! So simple and yet a wonderful looking loaf. I can imagine dipping it into some tomato sauce… *drool* Thanks for the great recipe! Beautiful simple and appealing cake – quite unexpected combination for us outside Italy, but I can very well see why it has become so popular – thanks to your lovely photos! What an interesting recipe!Perfect for late summer, when faced with an overabundance of zucchini 🙂 Your photos certainly give a dish with an ‘unappealing’ name a wonderful appeal! What a lovely recipe for our veggie baby shower. I’m so intrigued to try this! The combination of zucchini, basil and sugar sounds so strange I must say, but it looks delicious. And I like that the centre is so moist. It would be very helpful if the unit of measures also showed the “English Customary Weights and Measures” so a mistake is not make converting the recipe. Please send me the conversion for this recipe into american cups and pan size I want to make it again using the right amount of ingredance The one I made was delicious but no one else would try it because it looked uncooked.Please I have zucchini coming out my ears. Hi Rose, thank you for your feedback!